Affinity Photo, a new image manipulation app released in beta last month, just may be what Adobe-hating Photoshop users have been looking for — a professional level photo editing program that does not require a monthly payment to Adobe. Let me be clear at the outset here — I love Photoshop. It is a wonder and has been my favorite app since the first time I saw it at a trade show in Atlanta way back when it would only work in black and white. What I don’t like is Adobe’s pricing scheme, that requires me to pay a monthly fee instead of outright selling me the program. Yes, I know, I can get Photoshop alone for as little as $10, per month, at least for now, but I would be locked in to Adobe, and if for some reason I decided not to pay, whoosh — Photoshop no longer works on my computer. There are a number of rivals to Photoshop out there such as Pixelmator or GIMP or even Photoshop Elements. But none of them are full-featured professional image editing programs. So that’s why I’m intrigued by Affinity, which I’ve been trying out over the past few weeks. It’s not (yet) a Photoshop killer, but it has a depth of features that should have the folks at Adobe looking nervously over their shoulder. If this is what is in the beta, then where will the program be in a couple of years? First off, go download the free beta yourself. It seems to be bug-free and most everything is working. I had two main impressions when I first opened the program: 1) This looks a lot like Photoshop, and 2) Wow, there are a lot of features. The left side of the screen really resembles Photoshop’s tool bar, from the arrangement of the tools right down to the icons. Click on the Blur icon, e.g., and out pop alternate choices for Sharpen and Smudge, just as in Photoshop. On the righthand side of the screen, however, things are different — there are icons that duplicate much of the functionality of Photoshop’s Adjustment menu. Click each one and an adjustment option opens, with a slider to change the intensity of the effect. At the top right is a row of abbreviations. Click each one and the menu below changes. In addition to the Adjustments menu I just mentioned, there is one for a histogram, color, swatches, brush shape and hardness, layers, effects such as bevel and glow, a styles option that I can’t figure out, and a link to Shutterstock for stock photos. One nice improvement over Photoshop is a “before/after” toggle for most of the options that lets you drag a vertical bar left and right to preview and review the effect. I use Photoshop CS6, primarily to edit photos, and in several days of playing with Affinity Photo, I haven’t discovered any feature in Photoshop that I’m missing in Photo, although I’m certain there are some, because both programs offer so many options. 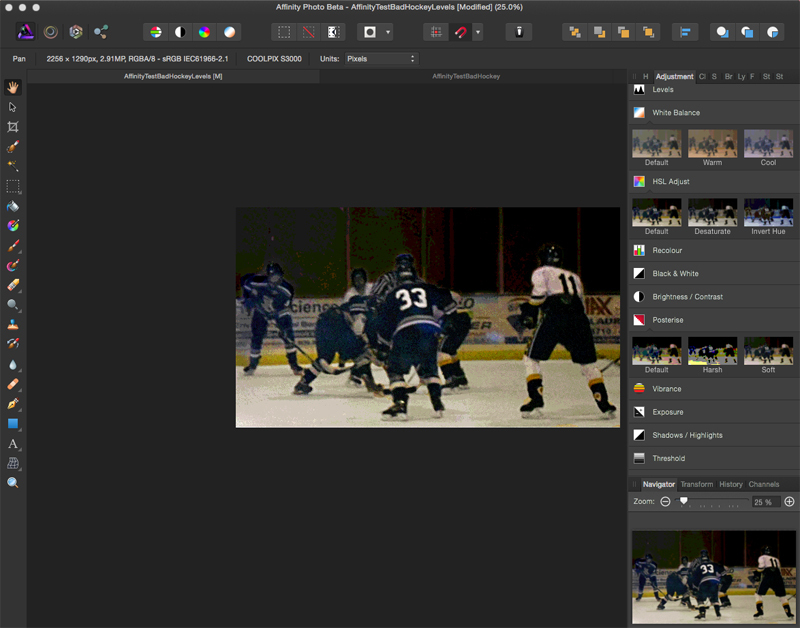 Affinity Photo also has a series of “personas” or modes that offer additional functionality. A Liquefy persona overlays a mesh over your image, allowing you to warp portions of it. There is a Develop persona that is still in development and apparently offers features for Camera Raw editing. And there is a Sharing persona that allows you to export your image. The logic for making these features “personas” doesn’t seem clear. Editing Camera RAW images seems to be a major feature set, while the Warp feature is very similar to other relatively minor menu items. And there is yet another icon, this one NOT a persona, that offers a range of options to determine how objects snap to a grid or to each other. That’s my one reason for caution in recommending Affinity Photo. I’ve gone through most of the menus and clicked on the icons and adjusted sliders on several dozen effects, but I have not come close to testing all of the options in the program. it seems to meet my needs for photo editing, but your experience may differ. But the current free beta seems like a great opportunity to find out. The pricing for Affinity Photo has not been set, but Serif, the company behind the program, already offers Affinity Designer, an Illustrator alternative that launched in June, for $49.99. I think it is certainly worth a try. Adobe badly needs some serious competition.